Mineral concentrations in grazing situations vary considerably with forage species, and stage of growth. As a result mineral requirements of grazing beef cattle are often not met or are marginal. While major nutrient deficiencies (energy and protein) are well defined in beef cattle, most often mineral deficiencies experienced in grazing situations are marginal and less well defined. These marginal deficiencies may escape notice yet lead to subtle reductions in production and the overall economics of the enterprise. Animals body response to nutrient deficiencies involves transfer from reservoir stores (e.g. fat, muscle & bone) to maintain homeostasis (e.g. heart rate, breathing, circulation, movement), increasing energy demands and lowering paddock harvest/conversion efficiency. Minerals’ required by beef cattle are classified as major and trace, both are essential for growth, reproduction, milk production, immune response, and fluid balance. A major mineral deficient in Australia is Phosphorous (P). Phosphorous levels in plants are closely aligned with plant energy and protein (i.e. nitrogen) concentrations; peaking during growing season, decline as mature, with lowest levels found in the dormant plant (eg. winter & spring - Figure 1). Limitations of other minerals (e.g. Ca, Cu, Co, Mn, Se & Zn) may also limit animal response to P and best considered in a complete supplementation programme. 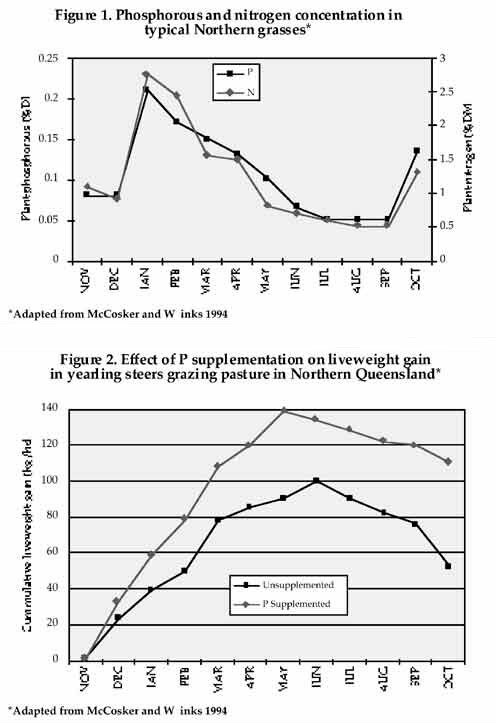 The colour of green forage may provide adequate energy and protein, however Phosphorous supplementation under these situations has been observed to improve weight gain in steers (Figure 2). Other production improvements are observed in pregnancy rates (e.g. decrease time to next conception), milk yield, weaning weight, improved bone strength, muscle development and general conformation. The greatest response to P supplementation occurs when nutrients such as energy and protein (i.e. nitrogen) are not deficient, minimising animal energy demands found with transferring minerals from body reservoirs. Dicalcium phosphate is generally used in loose mineral mixes, and phosphoric acid in molasses licks as a source of P. Combinations with protein meals may also be considered to ensure protein (i.e. nitrogen) adequacy.